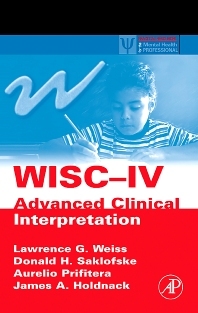 For both experienced psychologists and graduate students, WISC-IV Advanced Clinical Interpretation moves quickly through the essentials of WISC-IV interpretation and onto an insightful analysis of the major cognitive domains assessed by WISC-IV. It is the intention of the editors to raise the standard of practice from a simplistic 'test-label-place' model to a clinical model of assessing to understand and intervene. In the first chapter, the reader is presented with a comprehensive array of societal and home environment factors for which there is empirical evidence indicating their impact on the development of children’s cognitive abilities, and ultimately their scores on intelligence tests. Subsequent chapters address issues related to the assessment of cognitive abilities that compose 'g', with special emphasis on the clinical correlates of working memory and processing speed from both neuropsychological and cognitive information processing perspectives. Each new chapter builds on material presented in previous chapters and progresses the reader purposefully through deeper levels of understanding of WISC-IV and cognitive assessment in general. Two chapters explicate the processing approach to interpretation that is the corner stone of the WISC-IV Integrated. A further chapter addresses the interpretation of WISC-IV findings within the context of other instruments as part of a full psychological evaluation. The final chapter provides an extensive case example of how to write psychological evaluation reports from a child-centered rather than a score-centered perspective that can have transforming impact on parents and teachers approach to the child. Overall, these four authors are the architects of a masterful new book on advanced WISC-IV interpretation from a clinical perspective, Together with the complimentary book, WISC-IV Clinical Assessment and Intervention, Second Edition these books provide the complete spectrum of information needed by all psychologists who use the WISC-IV in clinical practice. School and child clinical psychologists, allied professionals such as special education teachers and psychiatrists who use the results of the WISC-IV.